“Author and wilderness expert Tom Brown has told students about the current status of the 104 prophecies given by Stalking Wolf (“Grandfather”). To date, 99 of these have come true. From the time that the 100th prophecy is fulfilled, the red sky prophecy’s fulfillment is purported to be seven to ten years beyond that date. “Much to the surprise of many of my white friends, Stalking Wolf was a prophet — a true prophet — the kind that 100% of his prophecies come true.” Tom continues, “Out of all of the personal and major prophecies that Grandfather foretold, there are four that stand out above all the rest. It is these four that mark the destruction of man and life on Earth as we know it to exist now. Yet Grandfather said we could still change things, even after the first two prophecies come true, but that there could be no turning back after the third.” This vision was given to the old Apache in the 1920s, and Tom met him when he was in his eighties. That was in 1962. “The spirit warrior spoke to Grandfather, saying, ‘These are the things yet to come that will mark the destruction of man. These things you may never see, but you must work to stop them and pass these warnings on to your grandchildren. They are the possible futures of what will come if man does not come back to the Earth and begin to obey the laws of Creation and the Creator. There are four signs, four warnings, that only the children of the Earth will understand. Each warning marks the beginning of a possible future.’ With that the spirit warrior was gone, and Grandfather was left alone in this strange new world. “The world he was in was like nothing he had ever known. It was a dry place, with little vegetation. In the distance he saw a village, yet it was made out of tents and cloth rather than from materials of the Earth. As he drew closer to the village the stench of death overwhelmed him and he grew sick. He could hear children crying, the moaning of elders, and the sounds of sickness and despair. Piles of bodies lay in open pits awaiting burial, their contorted faces and frail bodies foretelling of death from starvation. The bodies appeared more like skeletons than flesh, their once dark brown complexions now ash grey. “As Grandfather entered the village, the horror of living starvation struck him deeper. Children could barely walk, elders lay dying, and everywhere were the cries of pain and fear. The stench of death and the sense of hopelessness overwhelmed Grandfather, threatening to drive him from the village. It was then that an elder appeared to Grandfather, at first speaking in a language that he could not understand. 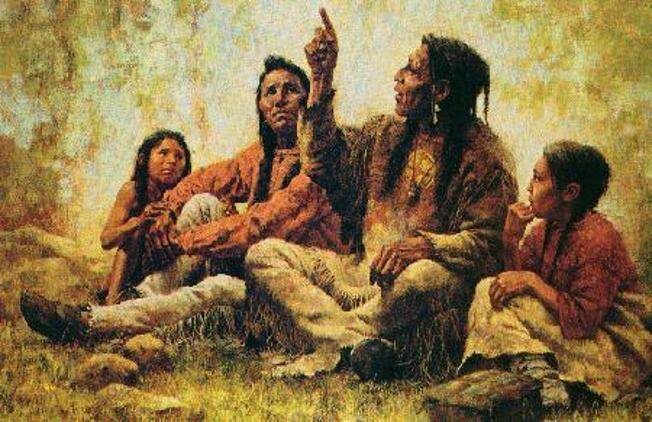 Grandfather realized as the elder spoke that he was a spirit of a man, a man no longer of the flesh but a man that had walked a spiritual path, possibly a shaman of his tribe. It was then that he understood what the old one was trying to tell him. “The old one continued. ‘These people should have been left alone. They once understood how to live with Earth, and their wealth was measured in happiness, love, and peace. But all of that was taken away from them when the world saw theirs as a primitive society. It was then that the world showed them how to farm and live in a less primitive way. It was the world that forced them to live outside the laws of creation and as a result it is now forcing them to die.’ The old man slowly began to walk away, back to death and despair. “He turned one last time to Grandfather and said, ‘This will be the first sign. There will come starvation before and after this starvation, but none will capture the attention of the world with such impact as does this one. The Children of the Earth will know the lessons that are held in all this pain and death, but the world will only see it as drought and famine, blaming Nature instead of itself.’ With that the old one disappeared, and Grandfather found himself back at the mouth of the Eternal Cave. “Grandfather lay back on the ground, thinking about what he had witnessed. He knew that it had been a Vision of the possible future and that the spirit of the Warrior had brought him to it to teach him what could happen. Grandfather knew that people all over the Earth were now starving, but why was this starvation so critical, so much more important than the starvation that was taking place now? It was then that Grandfather recalled that the tribal elder had said that the entire world would take notice but that the world would not learn the lessons of what the death and the famine were trying to teach. The Children of the Earth would die in vain. “It is then in the years of the first sign, that man can change the course of the probable future. It is then that he may understand the greater lessons of the famine and the disease. It is then that there can still be hope. But once the second sign of destruction appears, the Earth can only be healed on a spiritual level. Only a spiritual healing can then change the course of the probable futures of mankind. With that the warrior spirit let Grandfather fall into a deep and dreamless sleep, allowing him to rest fully before any more Vision was wrought upon him. “Grandfather awoke at the entrance of the cave once again, the memory of the warrior spirit vivid in his mind, the spirit’s words becoming part of his soul. When Grandfather looked out across the landscape, all had changed. The landscape all had changed. The landscape appeared dryer, there was no vegetation to be seen, and animals lay dying. A great stench of death arose from the land, and the dust was thick and choking, the intense heat oppressive. Looking skyward, the sun seemed to be larger and more intense; no birds or clouds can be seen; and the air seemed thicker still. It was then that the sky seemed to surge and huge holes began to appear. The holes tore with a resounding, thunderous sound, and the very Earth, rocks, and soil shook. The skin of the sky seemed to be torn open like a series of gaping wounds, and through these wounds seeped a liquid that seemed like the oozing of an infection, a great sea of floating garbage, oil, and dead fish. It was through one of these wounds that Grandfather saw the floating bodies of dolphins, accompanied by tremendous upheavals of the Earth and of violent storms. “As he held fast to the trembling Earth his eyes fell from the sky, and all about him, all at once, was disaster. Piles of garbage reached to the skies, forests lay cut and dying, coastlines flooded, and storms grew more violent and thunderous. With each passing moment the Earth shook with greater intensity, threatening to tear apart and swallow Grandfather. “There was a long pause as Grandfather thought of the impossibility of holes in the sky. Surely Grandfather knew that there could be a spiritual hole, but a hole that the societies of Earth could notice would hardly seem likely. The spirit drew closer and spoke again, almost in a whisper. ‘These holes are a direct result of man’s life, his travel, and the sins of his grandfathers and grandmothers. These holes, the second sign, will mark the killing of his grandchildren and will become a legacy to man’s life away from Nature. It is the time of these holes that will mark a great transition in mankind’s thinking. They will then be faced with a choice, a choice to continue the path of destruction or a choice to move back to the philosophy of the Earth and a simpler existence. It is here that the decision must be made, or all will be lost.’ Without another word the spirit turned and walked back into the dust. “. . . It was at the end of the fourth day that the third Vision came to him. As he gazed out onto the landscape toward the setting sun, the sky suddenly turned back to a liquid and turned blood red. As far as his eyes could see, the sky was solid red, with no variation in shadow, texture, or light. The whole of creation seemed to have grown still, as if awaiting some unseen command. Time, place, and destiny seemed to be in limbo, stilled by the bleeding sky. He gazed for a long time at the sky, in a state of awe and terror, for the red color of the sky was like nothing he had ever seen in any sunset or sunrise. The color was that of man, not of Nature, and it had a vile stench and texture. It seemed to burn the Earth wherever it touched. As sunset drifted to night, the stars shone bright red, the color never leaving the sky, and everywhere was heard the cries of fear and pain. “Grandfather sat in shocked horror as the voice continued. ‘From this time, when the stars bleed, to the fourth and final sign will be four seasons of peace. It is in these four seasons they must live deep within the wild places and find a new home, close to the Earth and the Creator. It is only the children of the Earth that will survive, and they must live the philosophy of the Earth, never returning to the thinking of man. And survival will not be enough, for the children of the Earth must also live close to the spirit. So tell them not to hesitate if and when this third sign becomes manifest in the stars, for there are but four seasons to escape.’ Grandfather said that the voice and the red sky lingered for a week and then were gone as quickly as they were made manifest. “It is here that man must heed the warning and work harder to change the future at hand.” –In a movie entitled 12 Monkeys, with Bruce Willis, people are sent back from the future to stop the events in the past that caused their prison-like existence in the future. So too is it with many of the high-level Lightworkers here on the planet today. Ascension is a learning process for all of Creation, and in the past, many planets without the necessary vibrational change in their inhabitants have been destroyed during the ascension process. As I have mentioned to few people before, this particular planetary ascension does not take place in the timeline many people have experienced in the future. This is the reason why so many have elected to come back here to suffer through these trials and tribulations one more time, in order to MAKE it work this time.